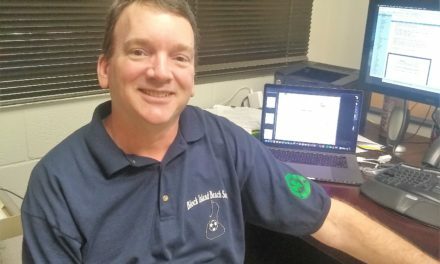 On any given Thursday evening, Keith Mylett can be found in Kakaʻako waving a lightsaber and sparring with fellow “Star Wars” enthusiasts. 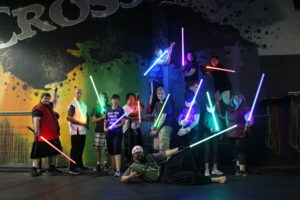 Mylett, who teaches lightsaber classes every Thursday evening, hosts multiple students who are whisked to a galaxy far, far away who feel that they are honorable Jedi Knights like Obi-Wan Kenobi, Mace Windu, and Anakin Skywalker, or evil Sith Lords such as Darth Vader, Darth Sidious, or Count Dooku. Mylett, a KCC alumnus who graduated from KCC in 2002, who started the Hawai‘i Light Saber Academy in 2015. Mylett, is a self-described “Star Wars” nerd who has capitalized on the uniqueness of a lightsaber. 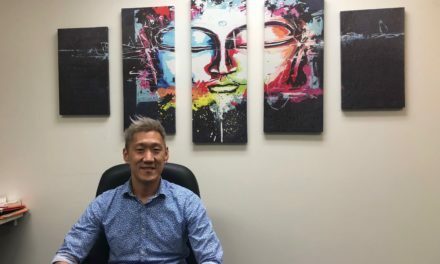 He created this community in 2015 due to his longtime love of “Star Wars” and desire to make his business stand out among others. 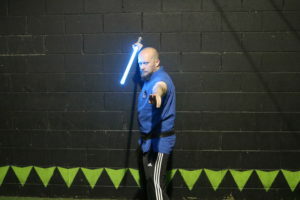 Mylett, who also teaches precision parkour, capitalized on the new LED lightsabers that were being produced after the movie “The Force Unleashed”, which came out in 2015. “Some people think that the sessions are cool from the start, and some people will laugh and say ‘look at those geeks,’ but as soon as anyone gets that lightsaber in their hand, their face always lights up and they grin like a little kid,” Mylett said. As a result of utilizing lightsabers into his parkour business, Mylett’s business has experienced an insurgence of new members. 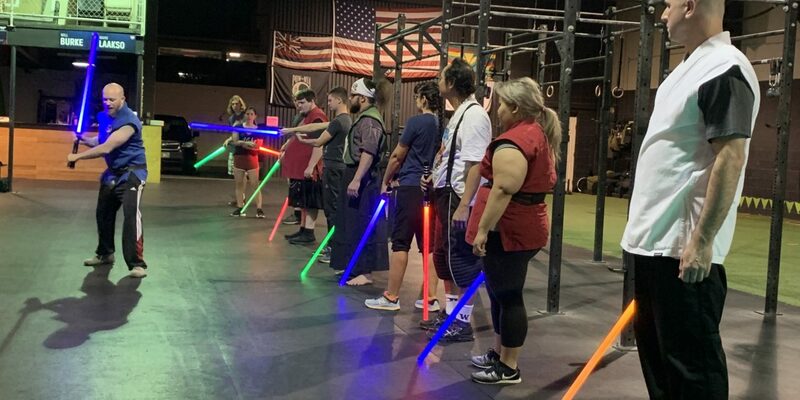 Many “Star Wars” fans have flocked to Keith’s practice sessions at Hawaiʻi Saber Academy, most are whom enjoy lightsaber combat and fencing. Mylett — a 41-year-old originally from Jamestown, N.Y. — graduated from KCC in 2002 with an associate’s degree in Liberal Arts. 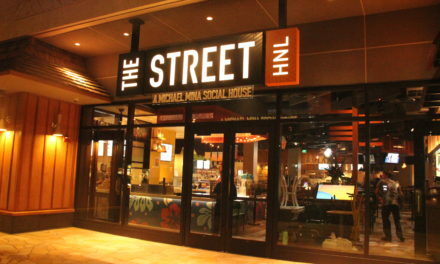 He later went on to graduate from UH-Mānoa in 2004 with a bachelor’s degree in Secondary English Education. 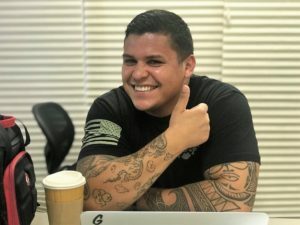 Along with teaching precision parkour and being the founder and master of Hawaiʻi Saber Academy, Keith Mylett has also been an English and AP Literature teacher at Kalani High School for the past 10 years. He has been running the Saber Academy for three years now. Mylett has loved “Star Wars” since he was a little kid. He grew up adoring the original trilogy of “Star Wars” which originally aired from 1977-1983, and Mylett was inspired by main protagonist Luke Skywalker. Luke was a character that Mylett connected with as a child, and Luke is one of the main reasons that he got into Star Wars in the first place. Lessons at Hawaiʻi Saber Academy are conducted with LED polycarbonate blades. A typical one-hour class session costs $50 for an entire month. The sessions involve a warm-up with simple movements, some solo drills, some sparring, controlled partner drills, “King of the Hill” matches, and tons of fun. Practice sessions are also conducted in fencing masks and lacrosse gloves, a safety precaution that Mylett takes seriously and that serve as a workout for participants. Mylett’s lessons captivate and interest first-time students quickly. 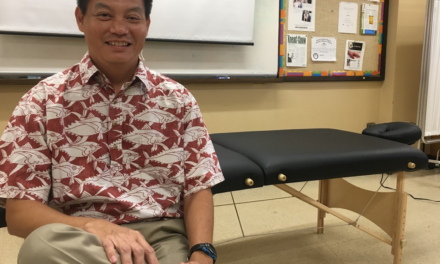 A Pacific Islands Studies professor from KCC, Kealalokahi Losch, is also a regular member at the practice sessions who has been attending Mylett’s sessions for over a year now. Mylett is a charter representative for Hawaiʻi Saber Legion, which is an international group that is free and open to the public. The saber legions have thousands of members and were recently on “Good Morning America.” They have a huge tournament for saber legions in Las Vegas every year that is broadcast on ESPN. 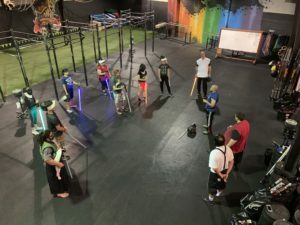 Mylett’s practice sessions are open to anybody who is interested in “Star Wars,” swordplay, or science fiction, or anyone who is looking for some new friends. Mylett prides himself on how welcoming he, along with his current students, is to new attendees. The group works with younger and older members, along with people who are in great physical shape and people who are trying to get into better physical shape.